If it is left on its default settings, the TV App on your iPhone can end up consuming a lot of your expensive Cellular Data. 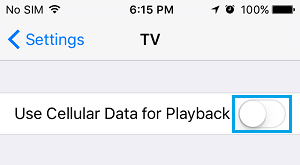 You will find below methods to Reduce Cellular Data Usage by TV App on iPhone. Cellular Data is expensive in most countries, so the best option for most users is to completely disable Cellular Usage by the TV App. This way the TV App on your iPhone will only be using the Free WiFi network. 1. Open Settings > scroll down and tap on TV. 2. 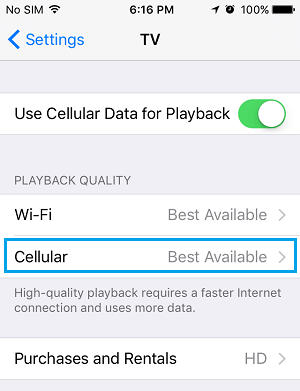 On the next screen, disable the option for Use Cellular Data for Playback by moving the toggle to OFF position. 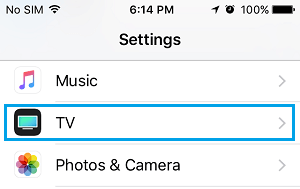 After this setting, the TV App on your iPhone will only be allowed to use the WiFi Network, completely ruling out the chances of Cellular Data being used by the TV App. 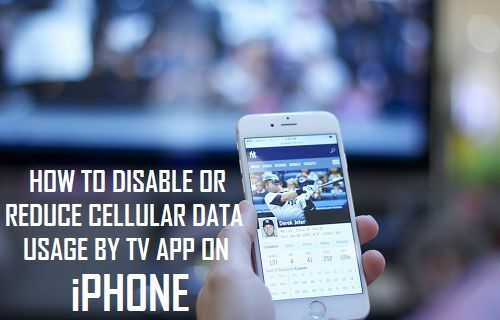 In case you do not want to completely stop the TV App from using Cellular Data on iPhone, you can reduce cellular data usage by TV App on iPhone by following the steps below. 3. On the next screen, tap on Good to reduce cellular data usage by TV App on iPhone. Since High Definition videos consume a lot of data, you should be able to achieve considerable savings in Cellular Data usage by watching videos in Standard Quality. By default, the TV App plays rental videos in High Definition quality. 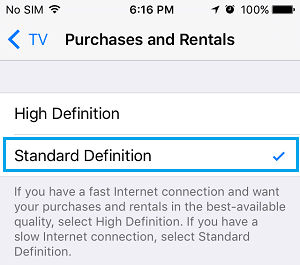 To reduce Cellular Data Usage by TV App, you can setup your iPhone to play Rental Videos in Standard Definition. 1. Open Settings > tap on TV. 2. On the next screen, tap on Purchases and Rentals. 3 On the Purchases and Rentals Screen, tap on Standard Definition. 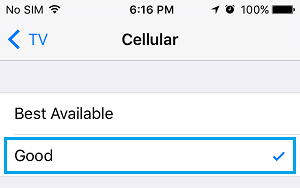 By making above changes, you should be able to prevent the TV App from using high amount of Cellular Data on your iPhone.